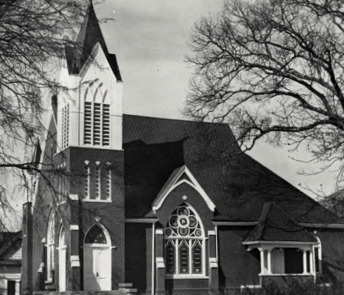 The United Methodist have a long tradition in Johnson County and Wrightsville, Ga. The Methodist Church building was the first house of worship to be built in town of Wrightsville in 1882. Before the church was constructed the Methodist worshipped in the courthouse. In the late 1930's an education annex was built to meet the needs of a more active and modernized Sunday School program. It was completed in 1942 under the administration of Rev. Claude Fullerton. This building phase included the second floor Fellowship Hall and kitchen. In 1969 a new house of worship was constructed. With many regrets and heavy hearts the old Sanctuary was torn down to make room for the new one we use today. The beautiful stained-glass windows were preserved and incorporated in the current Sanctuary and in our Memorial Hall. In the 2000's we began construction on our Memorial Hall which is our large gathering area. We offer one of the finest rooms in Wrightsville which can seat over 175 for meals and special events. We have also completed numerous renovations to all of the building in use. In 2010 we made improvements to our Children's area and nursery in our Education Building. In 2017, we completed reinovations to the upstairs of our Education Building and created a dedicate space for our youth gatherings and a casual space for meetings. Thanks to Georgia's Virtual Vault for the image of the Sanctuary.